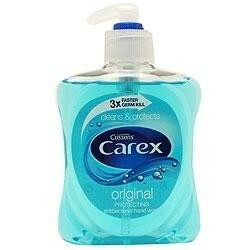 You can use Carex regularly without drying your hands. As it has been dermatologically tested to be gentle on your skin, Carex Original supports your skin's natural antibacterial defences, and with our unique blend of moisturisers, your hands will feel soft, smooth and hygienically clean. void contact with eyes. In case of contact, rinse well with water. Do not use on fabric. Carex Original Blue Antibacterial Handwash Liquid is one of my favourite hand washes, it cleans, moisturizes and removes/kills germs, i love the scent it is so fresh and it is very gentle on my sensitive skin and easy to wash my hands with, i absolutely love using it and love the colour because blue is a very calming colour and reminds me of water which is clean.i definitely recommend buying. I used to buy this product, until I found something ticker in consistancy. It is antibacterial has a light liquid gel consistency, which means needs to use a reasonable amount of wasing liquid to get to the surface. I do not like the color. I think it is not nice and not look to good in the bathroom, do not have a design value. It is a handy product and quiet good for the money. I need to use hand cream after use, but that is the same for most hand wash's. Good easy to use product, that smells nice and fresh. Simple and effective (and always on offer somewhere so very affordable). It's light enough to use whenever you need it but seems very effective both for cleansing and killing germs. Nothing particularly special but it works. This is one I often have in my kitchen as I like antibacterial handwash in the kitchen to ensure good food hygiene. It is an okay scent , nothing that exciting but it does smell clean and also cleans when I have been preparing food like onions.